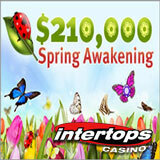 Spring has sprung at Intertops Casino where another massive casino bonus event has just begun. The casino, popular all over the world, will be giving away $210,000 during its Spring Awakening casino bonuses. Every week, 300 players will get $30,000 in casino bonuses. There will be a $1000 Grand Prize draw April 28th. Intertops Casino players earn rewards points based on playing and wagering. Every Monday they get bonuses up to $500 each based on their points. If you rank in the top twenty of any week's final scoreboard you're entered in the $1000 Grand Prize draw. $30,000 in weekly prizes during spring casino bonuses event at Intertops. Intertops has hundreds of casino games from Realtime Gaming, there is also a poker room and sportsbook.